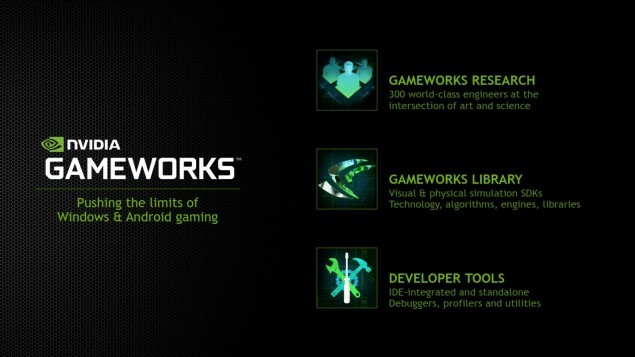 Through an official press release, NVIDIA announced the worldwide availability of the NVIDIA Gameworks SDK 3.1. The new software developers kit introduces new groundbreaking graphics techniques for shadows and lighting as well as two new physical simulation algorithms released as betas. “It’s our passion for gaming that drives us to tackle the technical problems presented by real-time rendering and simulation,” said Tony Tamasi, senior vice president of content and technology at NVIDIA. “Our GameWorks technologies push the boundaries of what’s possible in real time, enabling developers to ship their games with state of the art special effects and simulations”. NVIDIA Volumetric Lighting — an advanced lighting technique that simulates how light behaves as it scatters through the air and atmosphere. NVIDIA Volumetric Lighting was first introduced in the hit video gameFallout 4. NVIDIA Hybrid Frustum Traced Shadows (HFTS) — an algorithm for drawing high-fidelity shadows that transition smoothly from hard shadows near the occluding object, to proper soft shadows in regions farther away. HFTS debuted in the hit video gameTom Clancy’s The Division. NVIDIA Voxel Accelerated Ambient Occlusion (VXAO) — NVIDIA’s highest quality algorithm for real-time ambient occlusion, VXAO is a shading technique that adds depth and realism to any scene. It surpasses older techniques by calculating shadows in world-space using all scene geometry, as opposed to screen space techniques that can only shadow from geometry visible to the camera. VXAO debuted in the hit video gameRise of the Tomb Raider. NVIDIA PhysX-GRB — a new implementation of NVIDIA’s popular PhysX rigid body dynamics SDK, which has been used in hundreds of games. This hybrid CPU/GPU physics pipeline improves performance by a factor of up to 6X for moderate to heavy simulation loads. NVIDIA Flow — a computational fluid dynamics algorithm that simulates and renders combustible fluids such as fire and smoke. Unlike previous methods, Flow isn’t limited to simulation of the fluids inside a bounding box. NVIDIA makes source code for select GameWorks libraries available to developers via GitHub. Source code for NVIDIA Volumetric Lighting and NVIDIA’s FaceWorks demo is available today. Source code for NVIDIA HairWorks, NVIDIA HBAO+ and NVIDIA WaveWorks will be available soon. For more details on Nvidia Gameworks, check out this website right here.